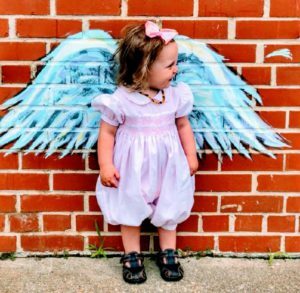 Down an alleyway in Lexington Park receiving a lot of redevelopment attention, there are a number of wings to be tried on by anyone strolling by. Some of St. Mary’s County Community Development Board Members found the experience positively uplifting. St. Mary’s County Community Development Board of Directors try on some wings. Maybe that lift is spreading. Just across that alleyway, the old Raley’s Furniture store is getting a gargantuan overhaul. And Bank Square Building, behind Patrick and Alisha Smith’s Wall of Wings, is undergoing a thorough remodeling into second-story executive suites two blocks south of Pax River. 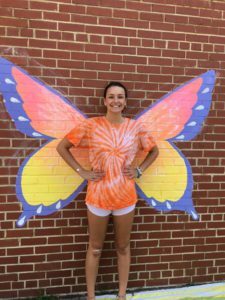 Kaylee Kirk of White Plains, Maryland, and North Beach Artist Roz Racanello introduced Lexington Park to a variety of wings last summer, thanks to the generosity of a grant from St. Mary’s County Arts Council and funding from St. Mary’s Community Development Corporation. Ms. Racanello, Arts Project Manager for SMCDC, introduced Lexington Park to murals with the Lexington Park Alive! mural competition. Kaylee Kirk brought her vision of fantastical wings to the Arts Council who introduced the idea to SMCDC. Ms. Racanello was the lead artist and technician to transform the Lexington Park Alive! design into a mural. 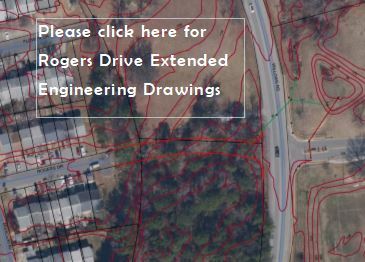 Her addition to t he Wings through Lexington Park’s playful design was to intersperse some realism and to assure a set of wings for strolling dogs would be included. This has all come to pass, and the Wall of Wings in Lexington Park are available to all along the side of the Amazing Nails & Spa 2 building on Great Mills Road. 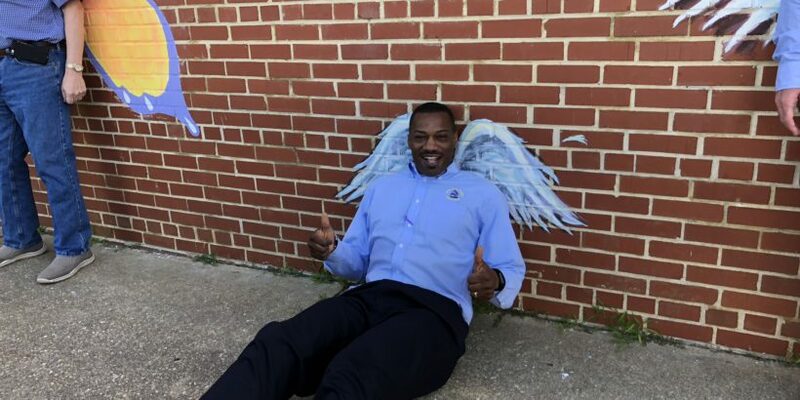 It should be noted, although a well seated dog would do these wings proud, thus far we have only captured photos of human fans: the charmer pictured here, and, pictured above, SMCDC Board Member Quincy Williams of Cedar Point Federal Credit Union. We find them both too irresistible to keep from posting.